Discussion about the 2012 NCAA Tournament can wait, for now. 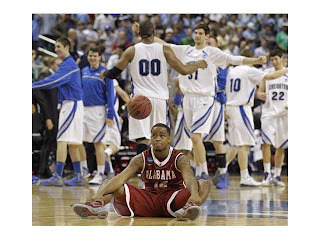 For now, let's focus on the demise of Alabama's season, which ended Friday in a one-point loss to Creighton. As the guys at the basketball blog say, in spite of the rough ending, the season is ultimately a good one. In my opinion, the season was, ultimately, a success. Starting four freshmen over the course of a season along with the turmoil surrounding the suspensions could have completely tanked the season. Instead the players and coaches responded and we played pretty well down the stretch. This team still isn't one of the top programs in the conference, but it's moving in the right direction. Which means it's already time to start talking about 2013. Everyone on the squad, except for JaMychal Green, could return in 2013. And that includes the mercurial Tony Mitchell, though I suspect most who follow the program have already divorced themselves from him and are prepared to move on. Coach Grant, for whatever it's worth, says there is no timetable. It is Grant's performance, to me, that bears discussion, before we move forward. Certainly, no one would argue with the notion that the program is moving in a positive direction after three years under Grant. We're recruiting better; we have more talent; the result each year has been progressively better; and what's more, in 2012, Grant proved that he was capable of meting out discipline and still holding his team together well enough to (largely) achieve the goals. Having said that, Grant's skills within the game — particularly on offense — remain ... um, in question. Through three years, this remains a basketball team that has no idea how to score when it needs to, has no "go-to" scorer to rely on and often appears to have no set offense in which it is confident. I hate bringing football into this because they're two completely different sports, but ... well, never mind. We need better offense. And possibly one shooter who's better than 30 percent. Let's leave it at that. So we can effectively put a cap on the 2012 season. At least until Whit emails me back and we get his opinions.